Description: Free, public domain image: U.S. Soldiers Running to Board a Waiting Helicopter in the Desert. 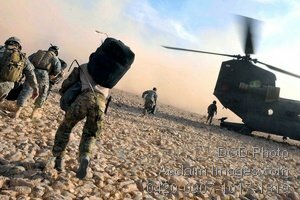 United States military soldiers, wearing combat fatigues and backpacks, run to meet a helicopter landing in the desert. The servicemen shown here are hurrying to board the chopper.